The 2019 Toyota RAV4 is Coming to Gateway Toyota! This winter sees the long-awaited 2019 iteration of the RAV4, Toyota’s famous compact SUV, finally arrive on Edmonton streets! At Gateway Toyota we’ve been eagerly digging up whatever we can about the completely revised 2019 RAV4 so we can share it with you! Here’s a small taste of what you can expect from this all-new RAV4 when it rolls through. Harnessing the power of Toyota’s all-new TNGA (Toyota New Global Architecture), the 2019 RAV4 rides a longer wheelbase that offers a wider track allowing for greater passenger legroom, headroom, and shoulder room. In spite of being bigger than before, the 2019 RAV4 promises to be lighter and to offer better fuel economy to consumers. An impressive and newly redesigned 2.5L four-cylinder engine offers more power than its predecessor and thanks to an eight-speed transmission, enhanced fuel efficiency. A planned XSE Hybrid promises to offer motorists greater performance and economy along with perks like a sport-tuned suspension. 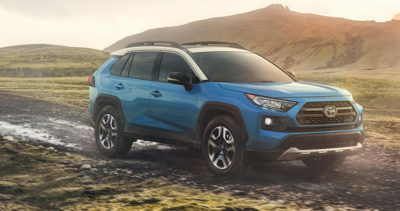 Fill out the form below and be among the first to learn about more of the exciting new features coming in the 2019 Toyota RAV4!